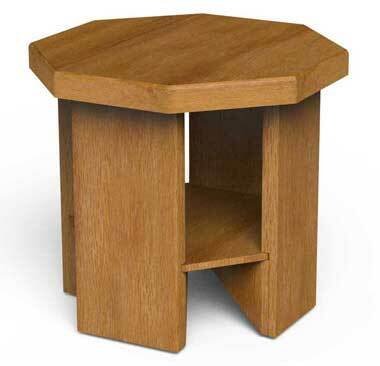 Build an octagonal table with a shelf, Mission style! Click here for detailed octagonal table plans. The home craftsman who is fairly skilled with woodworking hand tools will be well repaid for a little extra care in making this mission center table, of unusual design. Most of the woodwork involved in its construction is quite simple, the element calling for careful work being the laying out and shaping of the octagonal top and the shelf. Because of the wide surfaces exposed it will also benefit the maker to plane, scrape, and sand down these surfaces carefully. 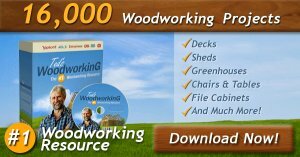 By selecting the best pieces of wood and setting their better sides out, the effect is also enhanced. The table can be finished in a variety of ways to suit the furniture of the room where it is used. Various kinds of hard wood are suitable, quarter-sawed oak being preferable. Begin the construction by gluing up the pieces for the top and the shelf. While they are drying, make the pieces for the legs, the lower braces, and the strips for the edging of the top. The upper portion of the legs is of double thickness, 7/8 in. stock being used throughout. Fit the lower supporting framework together as shown in the bottom view of the shelf, two of the braces extending across the bottom and the others butting against them. When the top and shelf are dry, brace the top with cleats screwed on underneath, as shown in the bottom view of the top. Lay out the shelf accurately, and shape it to a perfect octagon, 25 in. across from opposite parallel sides. Make a strip, 1 5/8 in. wide, and use it in marking the layout for the top, from the shelf as a pattern, the edges of the top being parallel with those of the shelf and 1 5/8 in. from them. Assemble the parts as shown, using glue and nails where practicable, and properly set nails for places where the fastening will be exposed. All the stock should be cleaned up thoroughly both before and after assembling. Four pieces for the casters are fastened to the legs with screws. The edging for the top may be mitered, with a rounded corner, as shown in the detail, or butted square against the edge of the top, as indicated in the photograph and the plan of the top, the latter method being far easier.